L: 140.5" x W: 113.5" x H: 37"
Daine 4-pc. Sectional Sofa For a living room with style, comfort and spacious seating, the Daine 4-piece sectional sofa will satisfy your needs. This sectional features gray upholstery that's both versatile and trendy. And, when it comes to comfort, Daine delivers with its huge seating area and extra accent pillows. With all these great features, you're in for a well-balanced room with character. For a living room with style, comfort and spacious seating, the Daine 4-piece sectional sofa will satisfy your needs. This sectional features gray upholstery that's both versatile and trendy. And, when it comes to comfort, Daine delivers with its huge seating area and extra accent pillows. With all these great features, you're in for a well-balanced room with character. L: 37.5" x W: 37.5" x H: 37"
Beautiful couch. Great purchase! Everyone compliments us on the couch! It's a comfortable couch. Baby spit up on it and it cleaned up nicely. We'll see if it lasts through the early years. We love it! Fit perfectly into our new house, service was on time and professional, and customer service (phone) was exceptionally helpful! The Diane sectional is exactly what my family needed for those lazy rainy days. Comfy and spacious so that the whole family can lounge in comfort. 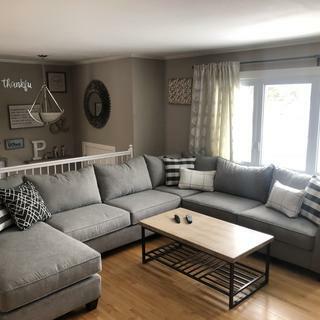 Love how big and comfortable this 4 pc sectional. Fabric is soft yet feels extremely durable. Love it!!! A very well built sectional. And extremely comfortable, just what we were looking for. It fits our room perfectly and can sit 9. We love the color there are so many options you can do with it. I am wondering how many people can fit on this couch. It looks like maybe 8 people? 3 on the armless sections, 1 in corner and 1 in chaise? Or are the armless sections too small and only fit 2 and noone in corner? BEST ANSWER: We swapped out the short side of the sofa for a piece that was a little longer. Really was a smart decision for us. Five adults and two dogs sit comfortably, lounging and watching TV. If you have the size consider customizing the sofa to suit your room. This couch fits 8 people. 6 people will be spacious and roomy. The armless section isn’t too small to fit 3. Very comfy. I highly reccomend. Jonathan. Thanks for such a quick response. We are debating between the 3 piece version of this and the 4 piece. The 3 piece has a 3 person side and a smaller 2 person side. The 4 piece has a 3 person and 3 person. I guess its a 400$ upcharge for the extra person. ~20 extra inches. Thank you. You have been a big help! I would say 2 in the armless sections and one in the corner. 1-2 in the chaise depending on how close you like to be. You can definitely fit 8 on the couch. It’s very comfortable and sits numerous people. We had 9 people on it. We had a party and everyone was comfortable. 5-6 people fit comfortably but you can squeeze 8! Thanks Aimee. I’m trying to figure out if the 3 piece of 4 piece is better. It seems like the 3 piece is 400$ cheaper and seats same number of people just that the 4 piece does it more comfortably. Thank you. How is this material with stains? BEST ANSWER: We have sofa about a year. No major spills or stains to clean but the sofa is seems to be wearing well. Dirt and dog hair seem to blend well with the grey color..lol FYI we paid a little extra to get a wider seat on the short side of the sofa which gives us enough room for all five adults and two dogs to sit comfortably. We get lots of compliments and are very happy with the purchase thus far. I have not gotten any stains on this couch yet but it is a light gray so any major stain would show. It’s a pretty durable material that I think would be easy to scrub out a stain with a shoat spray or stain remover and then let dry. Luckily I have not gotten any stains as of yet but I’m extremely happy with this purchase. Looks great and and so far I am happy with the quality of the product.